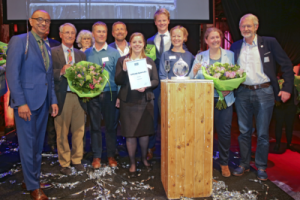 In 2017, HydroNET has won the prestigious Partners for Water Award for co-created water and climate services. The award-winning project started in 2012 during a workshop organised by the Kingfisher project. In that project, Dutch water boards cooperate with catchment management agencies in South Africa. With the support of Partners for Water, a Dutch – South African consortium was formed to co-create climate and water services: HydroLogic, eLeaf, South African Weather Service, KNMI, University of Twente, WineJob and IUCMA. South Africa suffers from water stress. Fresh-water demand is expected to exceed water availability by 2025. To efficiently manage the available water resources and reduce the impacts, water managers need access to historic, current and forecasted water and weather information. The online HydroNET Water Control Room translates terabytes of data from radars, satellites, and other monitoring sources into easy to understand online decision-support dashboards. These dashboards empower water managers to make well-informed and transparent decisions for the sustainable management of their water systems.